What Is DA Form 3437? DA Form 3437, Department of the Army Nonappropriated Funds - Certificate of Medical Examination is an official form used to record the results of a pre-employment physical examination of NAF employees. The certificate can also be used during periodic job-related physical tests. An up-to-date DA Form 3437 fillable version is available for filing and download below or can be found through the Army Publishing Directorate website. Be in contact with food that will be consumed by others. The most recent version of the form - sometimes incorrectly referred to as the DD Form 3437 - was released by the Department of the Army (DA) in August 2016 with the previous editions obsolete. How To Fill Out Da Form 3437? proponent agency is DCS, G1. MR. - MISS - MRS.
4. STREET ADDRESS AND APARTMENT NO. 13. (A) HAVE YOU ANY PHYSICAL DEFECT OR DISABILITY WHATSOEVER? (B) DOES THE VETERANS ADMINISTRATION RECOGNIZE SERVICE-CONNECTED DISABILITY IN YOUR CASE? physician for purpose of identification. PLICANT? TEST EACH EYE SEPARATELY. (D) COLOR VISION: IS COLOR VISION NORMAL WHEN ISHIHARA OR OTHER COLOR PLATE TEST IS USED? IF NOT, CAN APPLICANT PASS LANTERN, YARN, OR OTHER COMPARABLE TEST? (C) IF ORGANIC HEART DISEASE IS PRESENT, IS IT FULLY COMPENSATED? (B) IS ORGANIC HEART DISEASE PRESENT? NO. IF "YES", HOW LONG HAS THE DISEASE BEEN ARRESTED? IF THERE IS HISTORY OF TUBERCULOSIS, IS ANY TYPE OF COLLAPSE THERAPY BEING RECEIVED AT PRESENT? FULL DETAILS UNDER "REMARKS." IS MEDICAL SUPERVISION NECESSARY? IF PRESENT, IS IT SUPPORTED BY A WELL-FITTING TRUSS? NO. IF "YES", STATE LOCATION AND DEGREE. 13. FEET: IS FLAT FOOT PRESENT? (B) HAS APPLICANT EVER BEEN HOSPITALIZED OR TREATED FOR A MENTAL ILLNESS? (F) ANY HISTORY OF EPILEPSY OR FAINTING SPELLS? NO. IF SO, GIVE DETAILS UNDER "REMARKS" BELOW. 5. STREET ADDRESS AND APARTMENT NO. requirements of the position for which this individual is being considered. none of the handicaps apply, enter the code "00." The medical certificate, in general, is a written statement from a medical worker which describes results of a medical examination. It can be used as a sick note or as evidence of a certain health condition. A DA Form 3437 is authorized for filing in the Civilian employee medical records folder. 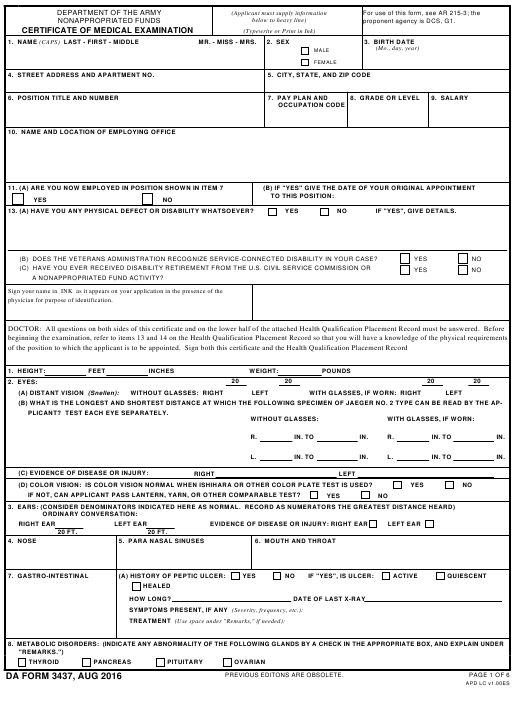 The Civilian employee medical records folder - or CEMR, for short - may be maintained either in the terminal digit filing system DA Form 3444-series or the Standard Form 66D during the entire course of working with the Department of the Army.